Goodreads says, "When her husband gets a new job, Marissa Price leaves the island of Manhattan for the island of Hawaii. Paradise seems like the perfect place to find herself, save her marriage, and reconnect with her daughter. But Marissa discovers her new life is less about beaches and beautiful sunsets and more about cows and lava flows. Their new home is a fixer-upper. But what most needs fixing--her marriage--is the first thing to crumble when her husband announces he wants time apart to find himself. Pulled in opposite directions, Marissa is faced with the most important decision of her life--a choice that will define who she is, what she wants, and where her happiness lies." Marissa and Paul Price, along with their daughter, are moving to the Big Island of Hawaii, because Paul was promoted. Marissa believes that everything will be perfect and their own little paradise, but as more time goes by, things start to fall apart for the Price family. First, their house isn't what they had hoped for and needs a lot of TLC. The adjustment to Hawaiian life isn't as simple as Marissa thought and to top it off, she thinks her husband is cheating on her and he says he wants time apart. Marissa is left to pick up the pieces and she realizes that she is going to have to make some big decisions that will effect her life forever. Mia King's Sweet Life is a delightful story that will have readers dreaming of their own Hawaiian paradise. Marissa was a tough character to deal with. She's pretty pretentious and materialistic, but that's because she was living a luxurious life in Manhattan before her big move. She judges people too quickly and has a hard time adjusting to the Big Island, but that's one of things I like about the story. It was interesting to watch her change and adapt to the lifestyle and the people, which are the polar opposite of what she's used to. Also, the supporting characters were well developed and unique. And of course, I loathed Paul from the beginning. He was insufferable! 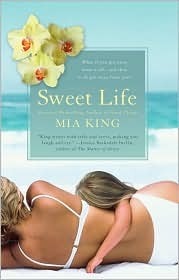 All in all, if you are looking for a beach read that will transport you to Hawaii, you must read Mia King's Sweet Life. I haven't read too many books that take place in Hawaii, but this one really captures the "Aloha Spirit." Now I am pining for a visit to Hawaii again! This sounds fantastic! I don't know how much I'd like Marissa but I love to read about Hawaii. Plus I am taking part in this reading challenge (Where Are You Reading) where I am trying to read books set in all 50 states and haven't read anything for Hawaii yet. I will definitely have to give this book a try this summer. I've always wanted to go to Hawaii. For now I'll have to settle for being transported there through the pages of a book :) Great review! Great review and awesome picture. I want to be a world traveler like you! This sounds like a great way to take an inexpensive trip to Hawaii, even if it is only in my mind. I will put this on my summer beach reading list. I too love when an author includes authentic recipes in their books. this book sounds lovely!! thanks for sharing your hawaii pic!